Valle, Susanne Collier, Ragnhild Støen, Rannei Sæther, Alexander Refsum Jensenius, and Lars Adde. 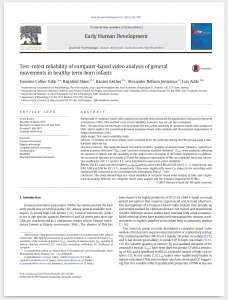 Test–retest Reliability of Computer-Based Video Analysis of General Movements in Healthy Term-Born Infants. Early Human Development 91, no. 10 (October 2015): 555–58. doi:10.1016/j.earlhumdev.2015.07.001. Test–retest reliability of computer-based video analysis of general movements. Results showed high reliability in healthy term-born infants. 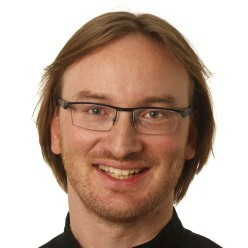 There was significant association between computer-based video analysis and temporal organization of fidgety movements.